Industrial, tech, and consumer goods company Bosch launched a Facebook campaign for its Canada home appliances division. 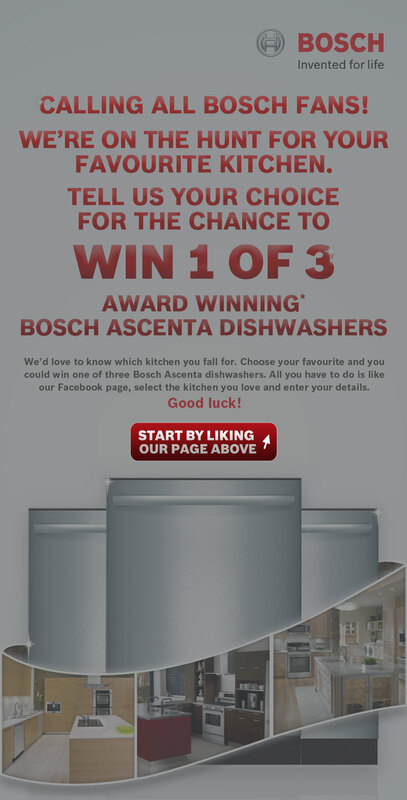 The campaign uses the social network Facebook to offer a giveaway of their Ascenta dishwasher collection. As Bosch can be seen as a more business-facing company, it provides a great case study for companies who are more rooted into industrial and large-scale products. The campaign is straightforward. It revolves around a giveaway of Bosch Ascenta dishwaters. To qualify for the giveaway, users simply like the Bosch Canada Home Appliances division Facebook page. Once they do so, they are shown photographs of three different kitchens with the Ascenta dishwater in them. Users then choose their favorite kitchen and fill out a form with their personal details. After this form is submitted, they are entered for a chance to win one of the three dishwashers. The primary goals of the campaign appears to be driving Facebook page likes and collecting possible customer information. The campaign is promoted through the Bosch Canada Home Appliances page via posts and being predominately displayed on the company’s cover photo. Given the contest’s simplicity, the campaign misses out on user engagement and increased communication of the Bosch brand of dishwashers. Users are not required to share with friends or check the contest after entering. A slightly more complex campaign would have generated a bit more buzz and therefore more “bang for the buck” for Bosch. Nevertheless, it is a great example of how brands with a more B2B brand image can use social media to promote themselves. The answer for many may lie in first launching with more consumer-facing divisions to get learnings and apply these to their B2B division counterparts.